Having a hobby is a wonderful thing, especially when you feel inspired to create something. Many people make their own jewelry - just look around at craft fairs. I once met a woman on a train and she was making her own bracelets to sell at her local craft market. With the incredible selection of glass, ceramic, crystal, and resin beads (and more) to choose from, you'll not be at a loss for color and variety. We're given the "basics" of what we'll need to get going. Things like wire (color and thickness); beads; clasps; pin-backings; jump rings; wire cutters; pliers, a jig (aha, now I get it), and more. Tricks of the trade, as it were. The best thing is that you won't need to do any soldering. Yay. 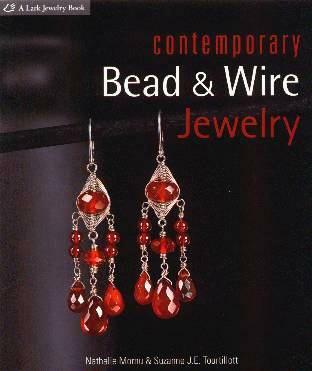 Some of the designs in this book that I found appealing were: Silver Flow Brooch (I'd like to use turquoise for that southwest look); Wandering Gypsy Bracelet (you can let loose with this one); Mardi Gras Bracelet (although I can't see myself knitting with wire); the Rajah Bangles; Icy Drops Necklace and Earrings (looks simple enough to make), and the Confetti Hoops (would also make a great bracelet). Beautifully illustrated throughout and eye-catching and tempting. Twenty designers created more than forty designs for this book. Get creative and soon you'll be making one-of-a-kind pices - great gifts. There's nothing like a visit to a bead shop! Use this book as a guide, and then customize your designs with your colors and shapes. Conclusion - This book would make a great gift and is wonderful for anyone looking for a creative and potentially lucrative hobby.